When I first started running in Barkhamsted, the only place I could handle for any distance, was along West River Road following the flat, winding banks of the Farmington River. Somehow glancing over at this true gem of a river always makes me run faster, naturally. In my opinion, walkmans are not necessary under these circumstances. The view of water flowing over rocks and the natural sounds seem to give me flight. After several years of running along the river, I gained the strength in my legs to run from my house on Boettner Road - just off Route 181 - down Beach Rock Road, past the Metropolitan District (MDC) headquarters, across the reservoir and back. Slowly I added distance and running south on Route 179 towards Ski Sundown. This same path provides a challenging road or mountain bike route, passing many historic and scenic sites along the way. After 22 years, I'm still finding the hills of Barkhamsted to be a challenge to run or bike. 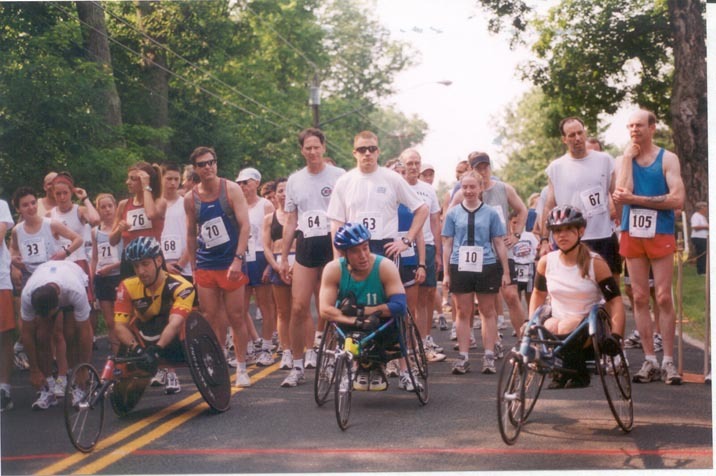 But I keep trying and maybe that challenge is why groups like the Greater Hartford Marathon hold eight mile training runs out here and the road bikers host a weekly time trials and a popular race looping the reservoir that I affectionately refer to as the Tour de Barkhamsted. I'll never forget that hot July day when I was running on Route 309 across the dam that I knew something was wrong. My body just didn't have the strength to complete the run so I walked all the way home from the East side of the reservoir. A few weeks later, it was confirmed, I was pregnant with my daughter, Jena. Running was hard for me during pregnancy so I took up biking my favorite routes, including a loop from our house down the banks of Lake McDonough, through New Hartford and back home following the Farmington River. Now, of course, those who pay attention in town know that Jena leads the family pack whether we are running or biking. In the eighties running sometimes involved leaving our house, traveling over Day Road to Park Road and all the way up to Slate Road, then turning back home for the fast run down Route 181 back to our home. Now I wonder how I ever managed to survive that particular route. One of our favorite family activities in the early eighties was to participate in the annual Lion's Club 5k run along the Farmington River. I even have a collection of T-shirts from these races, many of which my teenage daughter Jena is now wearing as collector's items. 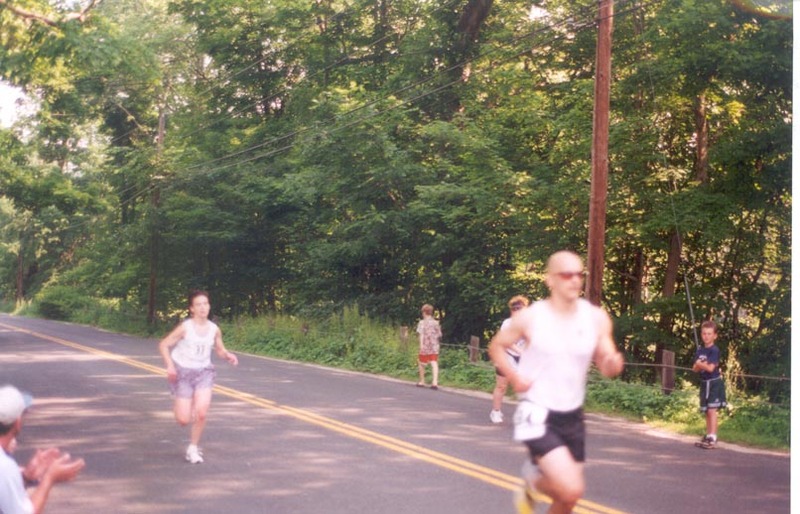 My family was delighted in 2001, when another community group, the Barkhamsted School PTO, began sponsoring a 5k River Run/Walk and Kid's Fun Run in June to support the school thereby combining the goal of physical fitness with the true beauty of our town. 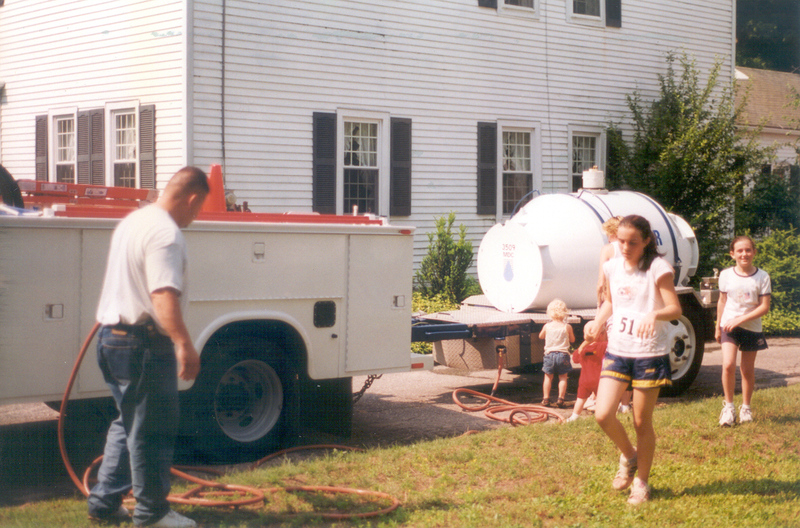 Photo at left- Participants at the starting line of the Barkhamsted School PTO 5k River Run in Pleasant Valley, June 2002. At right, runners nearing the finish line. Photo at left- Pleasant Valley emergency medical technicians at the 5k race...just in case! At right, drinking water provided by the Metropolitan District Commission. In the late eighties John and I were avidly training for summer biathlon competitions, which involve running and shooting. Then John and I changed our pattern and went back down to West River Road. We d park our car in the Town Hall lot and then run to the shooting range on the west side of the road across from People s State forest. One of us would practice shooting, while the other one would run. The passion for summer biathlon faded shortly after Jena was born in 1986. It is difficult to bring young toddlers to a shooting range. The range along West River Road was closed in the early 1990s. Another one of our favorite summertime routes is to run or bike down from our house to Stancliff Cove, take a dip and bike back or get a car ride home. Going to the Cove from our house is like being on a downhill only roller coaster, but coming home, well you need the legs of that famous U.S. Postal rider, Lance Armstrong to make it backup all the hills! The Greasers run and/or bike year round, but only in the winter when daylight and road conditions permit. Besides the fact that running and biking lets you really examine the historic homes and buildings in our rural town, there is a lot more to see in terms of wildlife, foliage and flora. Each season in Barkhamsted has true beauty, much of which seems to be captured more easily in my photographic mind while running. For instance, I can always tell when our town is in peak foliage because of the way the colors mix with each other and the sky as I past the crest on my way down Beach Rock Road. I've even stopped tourists on their way to the lookout on Beach Rock, or in one of the pull-offs on Route 309 to make sure they take the time to hike out the overlook trial to see the Metropolitan District Reservoir in all it's glory. This view is also enjoyed annually by the hundreds who attend the combined area churches Easter Sunrise Service on the Beach Rock overlook. I have even been known to get up before dawn and run to the service, sometimes even wearing a wool hat and mittens. I always catch a ride home after this jog! Thousands of people canoe, kayak and tube on the Wild and Scenic Farmington River, but they may be surprised how much wildlife can be seen in Barkhamsted while running, walking or biking. I've seen, blue heron, Osprey, turtles, beavers, leaping fish and Bald Eagles. Luckily, the one time I saw a bear on Route 181 near the cemetery, I was driving home in the dark. Photo above- Easter sunrise service at Beach Rock- April 2001. After years of examining the roadsides carefully on my jaunts around town, I certainly didn't think those state signs were necessary to remind us of the "Scenic Road" ahead. To me these signs just add more urban clutter, but then again I m passing them at a slower pace. Most likely these signs were a State Tourism project, and I suppose they do help visitors realize what a scenic and historic town they are passing through while in Barkhamsted. In fact, it was while running and biking in town that I first became aware of the important work of the Barkhamsted Historical Society with the relocation and restoration of the Center School House. The Senior Center has also been a credit to the town. I remember running by the Senior Center when it was privately owned in the early eighties. The lady of the house, Maud Laughlin, used to meticulously plant her flowers and tend to her garden. In June this year, I was so glad to see a volunteer clearing the brush away from the roadside, and planting in the backyard of the Senior Center. I'm sure Mrs. McLaughlin would be so happy with the results! I do not know of many senior facilities in this state with such a gorgeous view. With the recent surge in popularity of mountain biking, Barkhamsted trails ideally suited for both beginner and advanced mountain Biking abound on the east side of the reservoir along Route 179, along the east side of the Farmington River beyond the parking lot where a dirt road turns into a nice middle level mountain bike trail, and following the black top road accessing the Goose Green beach. This route also accesses the MDC's Braille Trail. Other mountain bike or backwoods running trails are located in the People s State Forest both along the east side of the river and up between Park Road and Route 181, north of Slade Road. 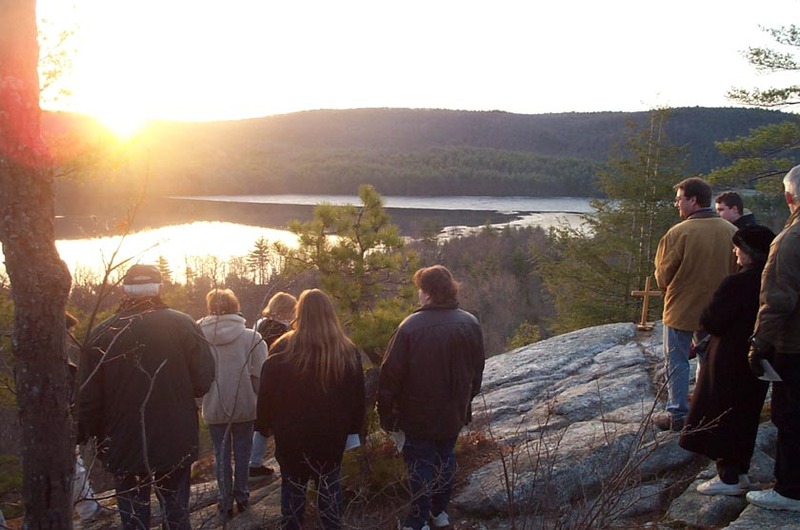 So if you know anyone who enjoys running or biking, they may find the same pleasures the Greasers have found through the years of outdoor activities in Barkhamsted. The Metropolitan District through their website www.themdc.com offers information and detailed maps on much of the area. The rest of the locations can be found by networking with others in town. Or better yet, grab your bike or running shoes, some water and get moving. I challenge you to discover the surroundings that so many travel for hours to enjoy! Note- On July 13, 2003, Kay and her daughter Jena ran in the Women's 5K Run which starts and ends at St. Joseph College in West Hartford. Jena had finished third in this race in 2001 and 2002 but in 2003 she finished first with a time of 20:00 minutes. There were 295 finishers in the 5K run. Kay had a time of 29:40. Kay and Jena won the mother-daughter 5K team award. Congratulations to the Greasers!